How much is a memory worth to you? How much would you spend to take some beloved remnant of your past and restore it to its original brand-newness (or maybe even better!) while still being fundamentally, recognizably itself? Probably quite a bit, right? Okay: How much would the pretty-good, decent first effort, needs-improvement "beta" version of a device built to do just that be worth to you? 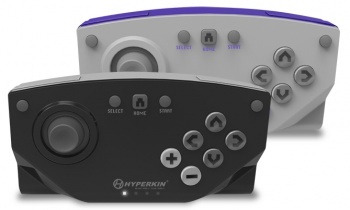 With The Retron 5, aftermarket game console superstars Hyperkin are betting that the answer is "around $140 retail." The device is billed as nothing less than a fountain of youth for the classic games of consoles past, promising retrogame enthusiasts, collectors and plain old nostalgiacs a means not just to "Frankenweenie" Golden Age game cartridges back to life but to make the experience of playing them even better than you remember - all the goodies of the classic-gaming emulation scene but without the murky downsides of sketchy downloads and aftermarket piracy issues. What they've actually delivered is a bit more than just that... but also a bit less: a paradoxically vital-feeling novelty boasting a quietly-miraculous onboard operating-system and user-interface that feels very much like the future of retrogaming... that's unfortunately hampered by hardware that, well... could've stood to be a little harder. Right off the bat, the amount of features and options packed into said hardware is impressively ambitious. There are separate dedicated slots for Sega Genesis, Nintendo Entertainment System, Super Nintendo and Japanese Nintendo Famicom cartridges on top and a slot up front for GameBoy, GameBoy Color and GameBoy Advance games. The system comes with one dedicated wireless bluetooth controller of its own (with additional controllers said to be available soon), but also boasts two ports each for original Genesis, NES and SNES controllers - all of which can be customized and remapped from the system's main menu. Unfortunately, all that inner beauty is housed in an outer shell that is rather less impressive. The casing is made mostly from an overly lightweight and cheap-feeling plastic that doubtlessly helped keep the overall costs down but feels too often like a poor fit for its intended use - the games its meant to be used with all hail from the heavy-duty physical-connection era of game/console interface, after all. I found myself having to find JUST the right balance of forceful and gentle to get certain carts into their respective slots. This was especially true for the bigger, awkwardly shaped NES games - though to be fair, those are the only ones not originally designed for a top-loading console. In addition, the console itself is so lightweight that you've actually got to hold it down physically while removing a game to avoid lifting the whole thing. These are all common issues that longtime console gamers are readily familiar with, but one of the hopes commonly pinned to revival devices like this is that they'll offer a way to introduce new generations to the classics, and the Retron 5 feels like it might be too delicate for younger hands. On the other hand, the outside hardware (while important) was never going to be the focus of this particular device. Retro clone-consoles are by now a standard feature of the gaming world, as collectors and hobbyists alike face the uncertain realities of time and breakdown for aging electronics. But while previous clones were a good alternative to buying increasingly expensive refurbished consoles for the budget-conscious, there were often recurring issues like hard to reproduce sound chips and some games being more difficult to interface with than others. But the bigger problem was that most of these "new" clones were still based off technology that was no longer fully compatible with modern high-definition TVs: Most can't even output to HD, and even if they could, most HDTVs are pre-set to smooth-out the pixelated textures that were the proper original state of these games - turning what were once sharp, detailed graphics into a blurry mess.